Superhero lovers and cosplayers will descend on Commerce this Saturday for the latest installment of the “Comic Book Invasion,” a free, open to the public event packed with exciting workshops, presentations, panel discussions and signings from over 30 comic book artists, writers and cosplayers. In its third year, the comic book conclave is a celebration of the popular culture surrounding graphic novels, according to the Commerce Public Library, the event’s sponsor. “These festivals allow for fans to cosplay, socialize, and meet the creative visionaries behind their favorite comics, said Jackiw, adding it’s also a great way for the library to reach out to readers and showcase all the great things Commerce libraries have to offer. The Commerce Comic Book Invasion will be held Saturday, Oct. 14 from 10:00 am to 4:00 pm at Rosewood Library located at 5655 Jillson St. Comic book vendors and local artists will also be on location with merchandise to sell and the Teen Center will be selling food to fundraise for the Pre-teen club. There will also be face painting and a costume contest. 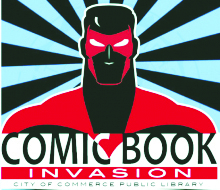 For more information about the Comic Invasion, call Teen Librarian Erik Jackiw at (323) 722-6660.